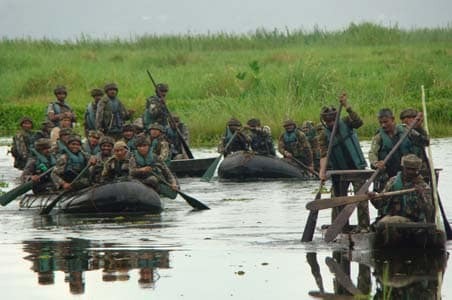 A 550 sq km stretch of a natural wonder- the Loktak Lake - is the most unlikely habitat for armed militants. But it is on these phumdis or floating grass where militants have always found a safe haven. It is common knowledge that militants based in the valley have used this lake as a transit base. But it has taken the security forces years before they could actually launch a flush out operation. The first one was launched in 2008 but like most army operations it was not sustained and the militants soon found their way back. Operation Summer Storm started on April 10 and is a joint operation by the State Police and 57 Mtn Division of the army. Twelve suspected PREPAK militants have been killed and five temporary camps destroyed. The army claims it was a clinical operation with no collateral damage but the villagers and fishermen are already on the streets demanding an end to the siege. The Loktak has the world's only floating National Park- the Kaibul Lamjao, which is the habitat of the Sangai or the Dancing Deer. Wildlife officials are worried that the operation may threaten the endangered Sangai. The army has clarified that the firing will not affect the animal corridor. Forest officials however, have been asked to stay away from entering the National Park till the operation is on. Counter insurgency operations in Manipur have always been in jumps and starts. The army admits that Manipur requires a different template of CI ops and till such time the government recognises it, hideouts like Loktak will continue to be revisited by militants as well as army operations.